This 2014 MDEA evidence photo shows the six state-issued electronic benefit transfer, or EBT, cards that were in the possession of Paul Robinson when he was arrested at his Bartlett Street apartment in Lewiston. None of the cards belonged to Robinson, who was sentenced to 10 years in federal prison on drug charges in July. 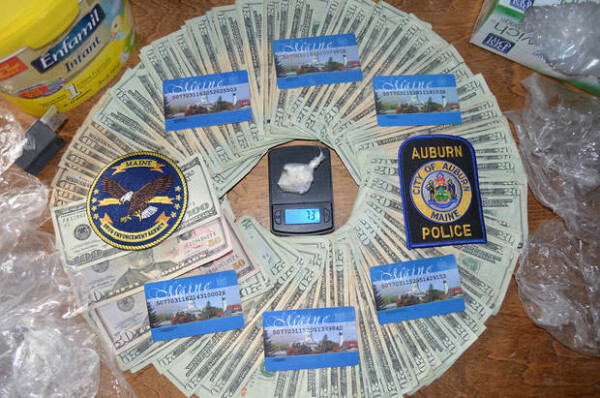 LEWISTON, Maine — When state drug agents arrested Paul Robinson in January 2014 for selling crack cocaine from his Bartlett Street apartment, they seized guns, drugs and cash, a typical evidence haul for a suspected drug dealer. But also in Robinson’s possession that day were six state-issued electronic benefit transfer cards — essentially debit cards loaded with welfare benefits, with some benefits available as cash — from state and federal programs meant to help poor families and children. Those cards had been reported lost or stolen by their owners 114 times and re-issued by the state, meaning the cards and benefits were most likely being traded for illegal drugs, officials said. Sam Adolphsen, chief operating officer for the Maine Department of Health and Human Services, said the repeated re-issuance of an EBT card is “certainly a red flag.” But currently the state cannot deactivate benefits regardless of how many times recipients lose their cards or say they are stolen. Those tasked with investigating drug crimes and welfare fraud in Maine say the two crimes increasingly intersect. Matt Cashman, a 19-year veteran of the Lewiston Police Department and an investigative supervisor for the Maine Drug Enforcement Agency, told the Legislature’s Health and Human Services Committee in April that in the previous 11 months MDEA agents had seized 40 EBT cards in 25 separate drug enforcement operations. Cashman went on to say that in the instances where a drug dealer takes the card in lieu of payment, once benefits are reloaded to the card they extract their payment and frequently an “interest” fee. In his testimony, Cashman detailed six specific cases, not including the Robinson case. In most cases, the cards were not issued to the suspects who were holding them, Cashman said. In one case agents discovered that an incarcerated dealer’s EBT card was being used in Alabama and had been regularly used there by another individual for more than two years. In October 2014, the MDEA received another complaint about the selling of controlled prescription drugs at a Lewiston residence and was told that the seller possessed 20 EBT cards, Cashman told the committee. Adolphsen said EBT card transactions that occur outside Maine account for more than $10 million a year in benefits. He also said that MDEA agents have noted that out-of-state transactions seem to frequently take place in the same cities that are often the source of illegal drugs being imported to Maine. Places such as the Bronx and Brooklyn boroughs of New York City, as well as Worcester, Lowell and other towns in Massachusetts, have been linked to drug-trafficking in New England, Adolphsen said. “They are almost always related back to a red flag for welfare fraud or a drug issue,” he said. Roy McKinney, director of the MDEA, confirmed those areas are all key points in the illicit drug supply chain. During the last legislative session, Cashman testified in favor of a bill by state Rep. Wayne Parry, R-Arundel, that would have increased the penalties for both cardholders and those who accept the cards as tender in a drug deal. The measure would have required those seeking replacement EBT cards to have their photos on the new cards. Currently, recipients must volunteer to have their photos on their EBT cards. So far the MDEA has yet to confiscate any EBT cards with photos on them, McKinney said. He said he does not know for certain that placing photos on EBT cards would be a deterrent to their use as tender in illegal drug sales, but he assumes it would. Beyond being seized by drug agents during warrant searches, cards with other people’s names also frequently turn up when drug suspects are booked at county jails. Parry’s bill, which also would have made it easier to prosecute those who trade their EBT cards for drugs, was rejected by the Legislature. Some argued that a drug dealer might obtain an EBT card through theft or other deception and the card’s rightful owner may not have necessarily turned it over willingly. Adolphsen said the presence of EBT cards in drug busts has become so commonplace that welfare fraud investigators at DHHS now regularly check the arrest logs in local newspapers for drug crimes and cross-reference suspects to see if they are also receiving state welfare benefits. McKinney said when MDEA agents find cards, they report that fact back to DHHS so the fraud unit can investigate. Adolphsen, like those who advocate for the poor in Maine, also said that the vast majority of benefit recipients abide by the law and the state’s efforts to curb abuse and fraud in the program are aimed at ensuring those who truly need help receive it. Adolphsen said vigorous efforts to deter abuse and fraud also help the programs retain credibility with the taxpayers who fund them. “We want taxpayers to have the peace of mind that their funds are going to people that legitimately need it,” he said. Since 2011, DHHS has doubled its number of fraud investigators, from nine to 18, and has subsequently increased the number of cases it refers to the state Attorney General’s Office for prosecution. A public hotline and online system for reporting suspected fraud has helped investigators find other cases. More than 4,000 tips came to investigators in 2014. Last year also marked a high point in referrals for prosecution at 81, resulting in 27 indictments and 26 convictions. So far in 2015, DHHS’s Fraud Investigation and Recovery Unit has referred 67 cases that have resulted in 16 convictions, but the unit is on pace to send more than 100 cases to the AG by the end of the year, according to Sorensen. He also believes that the word is getting out that DHHS is taking the issue seriously. Sorensen noted there is no easy way to measure the deterrent effect of beefed-up fraud enforcement. Adolphsen recalled a telephone conversation between a jail inmate and his mother that was recorded by investigators in which the inmate was trying to convince his mother to forge his signature so his welfare benefits would be reloaded onto an EBT card. Recipients of SNAP, the Supplemental Nutrition Assistance Program, can’t withdraw cash on their EBT cards the way recipients of the Temporary Assistance for Needy Families program can. But EBT cards with only SNAP benefits loaded onto them are sold for cash or traded for drugs, often at a discounted value. In July a Lewiston woman was charged with selling her $1,000 of monthly SNAP benefits to a Brunswick man, who was charged with trafficking in welfare benefits and theft by deception. Recipients also falsify information, sometimes by claiming dependents who don’t actually live with them to increase the amount of money being loaded onto an EBT card. In January, another Lewiston woman was sentenced to three months in jail after she falsely claimed her 16-year-old daughter was living with her and collected more than $10,000 in SNAP and Medicaid benefits. Under federal law, welfare recipients who are found to have used either EBT cards or their benefits to procure illegal drugs face a two-year suspension of benefits for a first offense and a lifetime suspension for a second offense, according to testimony provided to the Legislature by Maine Attorney General Janet Mills. Some are asking whether the beefed-up investigation unit at DHHS, which costs between $700,000 and $800,000 a year, is worth it, given the amount of money being recovered from those found guilty of defrauding the system. So far in 2015, judges have ordered about $230,000 in restitution, and over the past five years about $950,000 in restitution has been ordered, according to Mills. It remains unclear how much of that restitution is ever actually paid back to the state. Tim Feeley, a spokesman for Mills, said he was unaware of any easy way to track how much gets paid back in cases of welfare fraud. Advocates for the poor say they agree that fraud in the system should be taken seriously and should not be tolerated, but they worry that the response by law enforcement and DHHS could be disproportionate to the actual problem. For example, Merrill said, in Maine only a tiny percentage — 0.009 percent — of the more than 200,000 people receiving SNAP benefits have been caught cheating the system, according to U.S. Department of Agriculture audits. Merrill said her organization tries to encourage policymakers to instead focus their energy on programs that change the economic dynamics of those in poverty. She said stories like the one of Paul Robinson’s arrest and others in Maine in which EBT cards have been taken as evidence in drug busts are often used to justify cutting funding to programs. “These stories are held up and sensationalized and then used as justification to make cuts to programs that impact people who genuinely need the help and are following the rules,” Merrill said. DHHS officials, including Sorensen and Adolphsen, say the efforts to stop abuse in the system are more about making the system fully accountable to the public that funds it. Merrill said laws already make it illegal to traffic welfare benefits and EBT cards, but the ongoing “drumbeat against welfare fraud” is stigmatizing a large group of Mainers who are only guilty of being poor. According to federal court records, Robinson, who also went by the street names “Pretty” and “T,” pleaded guilty in July and was sentenced to 10 years in federal prison. The six EBT cards in his possession when he was arrested had been reissued 9, 12, 13, 15, 18 and 47 times, respectively, Adolphsen said. All of those cardholders are being reviewed by DHHS investigators.